Record everything you write and hear. What Makes Livescribe Smartpens So Smart? Livescribe smartpens have redefined the age-old tool of pen and paper in 21st century education with a new genre of technology. This 21st-century version of pen and paper (a “smart” computer in a pen) combines four modes of communication - reading, writing, speaking, and listening - in a simple, low cost, and convenient format of pen and paper. While taking notes during a lecture or discussion,the smartpen records the conversation and digitizes the handwriting, automatically syncing the ink and audio. By later tapping the ink, the smartpen replays the conversation from the exact moment the note was written. Notes and audio can then be uploaded to a PC or appear instantly on your device, where they can be replayed, saved, searched, and shared. It's perfect for allowing home-bound students or students who were absent from class to hear as well as see the lecture or assignment explanation. But while the technology is relatively new, the research stands behind the modes of learning that smartpens provide. Livescribe smartpens provide a fantastic opportunity for every student to never miss a word again and is becoming an essential piece of assistive technology in the classroom for many students. Smartpens are opening doors everyday to new possibilities for administrators and educators in the workplace, students who are struggling to keep up, homebound students, special education students and resource paraprofessionals, and ESL learners and educators. The 1st grade student using the Livescribe pen at literary centers. The district administrator using the pen to record audio and notes at meetings, classroom walkthroughs, and teacher observations. The teacher making daily instruction accessible to students and parents anytime, anywhere. The high school student revisiting daily instruction as many times as needed to build comprehension. The middle school parent accessing teacher notes and lectures to assist their student with homework. In my 20+ years of teaching, I have had nothing that has actually changed how I teach my students more than pencasting. Go beyond notetaking with your Livescribe smartpen! Anytime access to daily instruction or homework helpers? Using recorded messages or instruction on the Livescribe pen to clone the teacher when doing small group activities? Differentiating the learning process for students with different learning styles and needs? Recording audio for self assessment, electronic portfolios, or school/home communication? 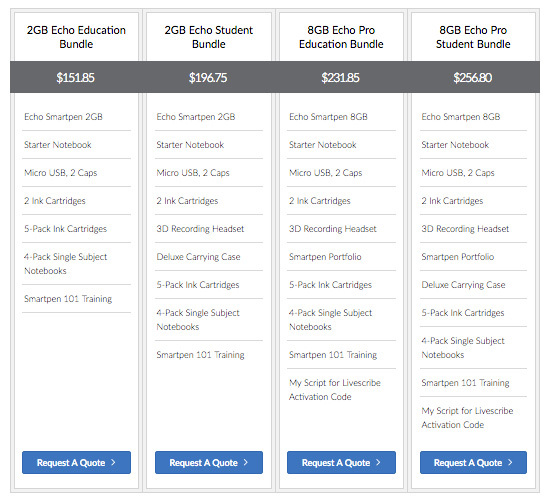 Be sure and check out our Livescribe Education bundles, where we've made purchasing easy by bundling the essentials in easy-to-order education bundles, all of which come with a free online training course! In addition, we'll answer those FASQ (Frequently Asked Shopping Questions), so you won't be shopping for smartpens blind. Instead, you'll have all the information you need to choose the right smartpen and accessories for you. I am so motivated, excited and encouraged to continue to use my pen in the classroom! I love this technology! The Livescribe pen is AWESOME!! I have it now embedded into Moodle and the students love it!